I am writing this last letter about our passage to Majuro from the comfort of a sturdy mooring, which is actually more challenging than you might think! Our laptop spent most of the last four days of the passage in our oven, in the hope of protecting it from both lightning and sea water, which probably gives you some idea of what our conditions were like! I need to take my mind back from my stable kitchen, where I am can eat dark chocolate, drink Black Adder licorice tea, and listen to the kids play cards with their friend Marino, to several days of wet and uncomfortable conditions. Daily rig check. This is before the wind and seas built up as you can see we do not have the hank-on staysail up yet. For those who had their heart in their throat while reading some of our earlier descriptions, or who felt like they were vicariously along for the ride: be grateful for the gap in reporting, as it was pretty hairy, and you probably didn't actually want to be aboard with us for the play-by-play as it unfolded!! Day 6 was the day that the wind was *supposed* to fill in (as was Day 5, as was Day 4 ...). The region near the equator is notoriously difficult for the global GRIB models to forecast, so this was not unexpected, but it did get tiresome, especially as by this time we were only working off Fluenta's considerable internal diesel capacity and had emptied our jerry cans. Our little black and white bird took advantage of the gentle conditions by quietly catching its breath and preening its feathers. Our small friend was very bright-eyed and observant, and apparently not at all troubled by its change in travel plans, as we transited further and further from its home territory. One wing would not tuck in where it belonged, so it hung somewhat uselessly below its body. We tried offering it cooked fish (our own leftovers), raw fish (a flying fish which jumped aboard for this purpose), and a carrot (by this time, we were just curious! ), but the only thing it seemed interested in eating were the little bugs it found in its feathers (likely fleas, if the experience of friends who hosted a little bird on their boat was anything to go by...). After resting for a day, it began exploring the aft deck a little bit, but it still seemed surprised each time it would try to stretch its wing and it didn't respond in the usual way. I wondered what welcome it (we) would get when we arrived in Majuro if it didn't fly away in the meantime. As for ourselves, we also made the best of the light conditions by making water and mandating morning showers for all hands; by the afternoon, the wind began to blow. Once it started, it made up for lost time! Soon we were close-hauled or close-reaching in about 10 kts. With the setting of the sun, a no-moon darkness gathered, and we entered an entirely new phase of the passage. As we were ghosting along with still-light winds, a rather amorphous cloud materialized just upwind of us. I didn't think that much could come of it since it had little shape or definition. I was wrong. As if we had sailed into a sinister cartoon, we were soon engulfed in the darkness, the wind piped up, and the usual 20-minute squall went on for well over an hour; the rest of the night was just a long alternating pattern of stronger and lighter winds within a massive system. We had entered the Inter-tropical Convergence Zone (ITCZ). The good thing about the evening that followed was that it gave me the chance to sail in teamwork with both big kids and we were too busy to get bored! Victoria did the first stint, and Johnathan took over for the late shift. It turned out that Johnathan preferred these dark conditions over daytime watches, as it meant that he couldn't see the seas/waves before they crashed onto the boat. It was a big help that he preferred to be downstairs looking after Benjamin during the day. Conversely, Victoria preferred to be in the cockpit all day and to sleep from early evening at night. With a night owl and an early bird, we had support for all the watches (and my mama-heart loved the one-on-one conversations with teenagers that developed)! By the time Johnathan and I 'rang in' the new year at midnight, I had lost count of the number of squalls, and the genoa was pretty much permanently reefed. Once we entered this new world, we experienced an ongoing and unpredictable series of squalls. The wind would suddenly shift and accelerate, and we would need to reduce the size of the genoa: the kids and I would turn the boat deep downwind, then with one easing the sheet and one grinding on the winch, we would reduce the foresail to a shadow of its former self. When the torrential rain and wind subsided, we eased everything out to maintain boatspeed (as the evening wore on, this became less of a factor, since the overall conditions were building). Another squall coming in. At least in the day you have a better idea of what they will be like. With daylight, on New Year's morning, Max and I hoisted the smaller (and sturdier) staysail, and switched to controlling the working sail area with the main. The staysail is ideal for winds of 15-30 kts, and we had reached the point where even in the lulls, we had plenty of wind for it! The days can usually be relied upon to be a little calmer than the nights, but in this case, the day was as wet and squally as the night had been. We flew the staysail with varying degrees of reef in the mainsail until the end of the trip. Since we were close-reaching, we were meeting the seas with momentum, and they were crashing and sluicing down the side decks. At one point during the morning, I asked Victoria if she had seen our little bird, as I couldn't see it on the aft deck. She looked out onto the side deck, and there it was, wobbling purposefully forward towards the shrouds. Each time a wave would come along, it would get knocked over, shake itself off, and continue its march. We had no idea what it was up to, so we watched it for a while. It appeared to be facing into the wind and exercising its wings; it spread them as if to fly a few times. Around mid-morning, a bigger wave came along and really knocked it over. When it stood up again, it seemed to have wriggled itself half-way under the life-lines. I couldn't bear to watch from the cockpit anymore, and clipped my tether to the jack lines to go out beside it to see if I could coax it back to the relative safety of the aft deck. Before I could even make my way anywhere near it, another wave came along, and with what I swear was a look of glee on its face, the bird looked at me and made its leap to freedom. Somehow, and for a reason that I couldn't really understand, this little bird knew it was time to return to the water. Given the conditions that we had over the next 48 hours, perhaps it sensed something we didn't know about the weather too!! In total, the bird was with us for 60 hours, and covered about 292 nm; I was relieved we didn't have to explain its presence to the officials in Majuro. This little passenger was not our only avian friend. One moonless night, a booby flew into the cockpit and settled quietly in the forward cockpit well, where he went unnoticed until Max stepped on him on his way downstairs! I'm not sure who was more startled, but Max scooped him up and placed him onto the leeward side deck, which apparently was not as nice of a location so he flew away before morning. The highlight of our New Year's Day was phoning dear cruising friends who had all gathered to celebrate their New Year's Eve in San Diego. Despite a somewhat scratchy satphone connection with our Iridium GO, there were happy tears on both ends of the call as we heard voices from EXODUS, NIRVANA, and NAUTILUS (visiting all the way from Belgium) for the first time in several years. It was a joy to attend their party for a few minutes, if only virtually. The kids had a chance to talk to each other, and then I talked to the grownups; everyone had that familiar sense of picking up right where we had left off. An ironic part of the call was that I was asked if we had experienced much lightning; I responded neutrally that we had seen some, but that we hadn't had much the previous evening. That night we had s qualls that lasted more than an hour each, and the worst lightning (and closest) I had seen yet! I found that I had a physiological reaction to the jolts of light: they occurred randomly, every few minutes, and I startled and my heart pounded with each one. At one point, I thought the lightning must surely be almost over, as I hadn't seen much in a while, and a moment later, a massive arc travelled horizontally between two clouds just downwind of us, looking for all the world like a dangling electrical wire drooping between two electrical poles. The human connection to others who had experienced their own stormy nights gave me confidence and comfort throughout that long and unpredictable night!! At this point, we were looking ahead to about four more days on passage with increasingly strong winds, and sailing as close-hauled as we could manage until the final turn downwind with about 100 nm to go. I pretty much told the kids to fend for themselves: there were snacks and crackers in the cupboard, they could watch as many movies and play as many video games as they wanted on the aft bunk, and cooking and parental attention would be minimal. As for me, I didn't have appetite for much besides crackers. We were already unplugging the Iridium GO and putting the iPads, radios, and laptops in the oven every night because of lightning. We began keeping them there during the day as well because of copious amounts of water dripping onto the chart table from the ceiling overhead. When Max wanted to check the weather, he would plug in the GO, take the laptop from the oven, balance on the port (downwind) bench, and quickly do his download; meanwhile, an old towel was layered over the chart table to keep the water somewhat contained. We always keep our companionway boards in when we are underway, and now we also had to close the companionway hatch, as the waves that were crashing onto the dodger were jetting water in through the openings and down onto the saloon table and floor; even with the cover closed, we had spray on the floor and on the saloon table. Max and I took turns sleeping on the bunk in the saloon, partly so we could be recalled quickly to the cockpit and partly because we were so salty (and sometimes wet) that we weren't fit to sleep on the sheets on the aft bunk! This bench turned out to be very comfortable: we were pressed against the side cushions by the heeling moment, and no small heels attached to five-year-old feet were nearby to kick us! We regularly use our radar to watch the progress of squalls towards us and to determine the best course through/around them. Usually, we can look at the radar and see a direction towards which we could sail to be out of the rain sooner; however, there were times when the squalls just seemed to keep going and going. We would think that we were sailing to a drier area, only to find out that the squall was so dense that it had just absorbed the entire radar signal until we got closer; the rain clouds just kept coming. We sometimes wish for a modern radar whose picture could be overlaid on the chartplotter; in the meantime, if the picture is tricky to describe in words, we take a photo of it and carry the camera upstairs! One evening when both of us were on watch dealing with a squall just before the handover, I noticed a funny little spot on the radar screen. Upon closer examination, it turned out to be a boat, about 4 nm away, which then haunted Max throughout his watch. It would sit still (fishing) then it would move, or he would just get some room upwind and have to turn downwind and point towards it in a big squall. We were so relieved several hours later to finally move beyond it! Any time one of us had to go on deck (clipped in, of course, and ideally with the boat turned downwind, during the day, and with someone else in the cockpit) we were guaranteed to get wet with the waves over the bow. The funny thing to get used to was that with a water temperature of around 30 deg C (32 at Tuvalu and 29 by Majuro) the waves crashing onto us were warm like a bath! Similarly, the water crashing over and into the cockpit kept us soaking wet, but not necessarily cold. 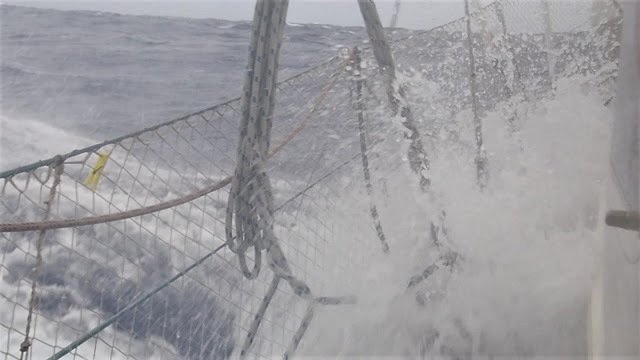 At one point, an especially big wave came sideways over the lifelines, plowed into the cockpit, and soaked Victoria and me, depositing several inches of water at our feet. I pointed out to her that waves like this were exactly the reason we kept the companionway boards in and had scupper drains! There was no point in trying to be dry in the cockpit; we just kept the same wet clothes set aside down below as our on-watch clothing and rinsed off and changed into dry clothes to sleep. Needless to say that we made a mental note that we would have to be more vigilant about staying dry as we sailed north! By the time we approach Alaska later this year, the sea temperatures will be hovering just above the freezing point, and we will have immersion suits at the ready in case we need to ditch. Speaking of wet, not only were we wet in the cockpit, and being dripped on at the chart table, the boat was increasingly wet down below. With so much water coming over the bow and down the side decks, it had plenty of chances to seek out any place where the adhesive around a fitting might have dried out or a window latch/seal might be loose. We had water coming into the V-Berth and saloon hatches as well as through the ceiling panels into the forward head (aka tool shed). I dug out towels and old rags to soak up the water, and we will add these areas onto our re-bedding list when we get to a drier location (ie north of the convergence zone, probably in an atoll). The decks were regularly awash with water. As we progressed north through the convergence zone, the wind continued to build between the squalls. We kept the main reefed and sheeted in for the steady-state winds, then when the squalls hit, we dropped the traveller and eased the main, spilling the wind as if Fluenta were a big dinghy. We had to reef significantly over our usual night-time configuration. I found the sound of the rig shaking even with none of the sails actually drawing extraordinarily unsettling, but (as usual for a reef early/reef often scenario) once the main was tiny, everything felt more manageable, and I could let go of the the powerfully irrational feeling of needing to call Max for every big squall. After a while, I even got into my dinghy-sailing groove, hand-sheeting the main sheet or traveller (each on their own block and tackle) with the lulls and easing them in the gusts. It was almost fun! oh, 9.7 kts is bit faster than we normally aim to go. More comfortable with a much reefed main and the staysail. The word that came to me at this time was "RESOLUTE". I felt resolute that we just needed to keep doing what we were doing, for as many watches as it took, and we would get to where we were going. Before RESOLUTE, the word that came to me as a question was "TRUST": did I trust the boat? did I trust the work that we (especially Max) had done to prepare before the passage? did I actually trust my often-repeated phrase "All will be well, and all will be well, and all manner of things will be well" (Julian of Norwich, 1373)? Or did I not? Friends of our had gone around Cape horn (http://svwindarra.blogspot.com/2015/03/rounding-horn.html) in another Stevens 47 a few years ago, so I was pretty sure our boat was sturdy enough for the conditions, but the water leaking in through the roof was worrying me: what if there was some weakness that we didn't yet know about? Trusting can be hard on a dark night, with no moon, big waves, and no one else in the cockpit, but once I realized that, on some level, I *did* have trust, I was able to set my jaw and focus on being resolute. We had this. By the morning of Day 8, we finally reached a point where the skies behind of us looked black and forbidding, while the skies ahead of us looked grey, but decidedly tropical. It was visually apparent that we had crossed through a wide patch of the convergence zone (squalls, lightning) and entered the North Eastern Tradewinds. We weren't entirely in the clear yet, as the convergence zone was threatening to follow us north, but when we looked back it looked ominous and when we looked ahead, it looked like the Tropics; after two days of being soaking wet and battling the conditions, that was good enough for me! We still had some hard sailing to do, and surprisingly we had bigger seas to come, but we were out of the worst it, and it felt like it was only a matter of time before we would arrive in Majuro. As we travelled north from Tuvalu, we actually passed through and around the islands of Kiribati. We were hard on the wind all the time (generally setting the Autopilot to "Wind-Hold" and adjusting the angle between 45 and 55 deg apparent, depending on the conditions. Once we were through the convergence zone, the winds built to a steady 15-20+, and the seas followed accordingly (we estimated them around 3m. Kiribati was generally downwind of us, which meant that it kind of taunted us with a sense of "turn towards Tarawa and the going will be easier" (in the same way that military physical training staff will sometimes taunt course members that they can quit running and stop at the Coffee Shop if they want out). The only catch was that if we diverted to Tarawa (or later to Butaritari), it would take us about a day to get there, we would spend several days clearing in and clearing out, and then be even harder on the wind once we had a weather window to set off again. If we had had some kind of mechanical issue, it was nice to know that there were ports of refuge on our route, but in the end, we would press on. Once we got to the other side of the convergence zone, we were even more determined to make it all the way to Majuro without a stop. By the morning of Day 9, we found ourselves at the point that we could bear off (turn downwind) and head for Majuro. For days, we had been sailing towards an imaginary point in the ocean where the island just south of Majuro (Mili) would be downwind of us so we could avoid sailing the entire way around it; at certain points it looked like we would not make it, and would have to sail south of Mili and and then be very hard on the wind for the last 100 nm. As it turned out, the wind veered just when we needed it to, and we made it with plenty of searoom around the windward side, which gave us the rewards of a beam/broad reach for the last segment. All of a sudden, the boat was not pounding into the waves, and we were not fighting the seas. What luxury! Sailing downwind seemed so lovely after so many days of being close-hauled. A quick check of the radar in the evening showed no squall activity at all! Now all we had to do was stay our course, and we would arrive. To improve our spirits even further, we finally caught some more fish: we caught a waloo followed by a mahimahi. It was almost pleasant! We reached the pass into Majuro Lagoon at around 1000 on Day 10. After an uneventful entrance, we had one last hurdle before we could anchor. I was head down on the bow, untying the anchor and removing the windless cover, chatting with Max on my Bluetooth headset, and not really looking around me, when he made an exclamation that made me look up. Under full sail close reaching at over 7 kts, we were bearing down on a small local fishing boat which was on our track, and Max could not physically turn the helm. The autopilot was in "Navigate" which means it follows its course with no variation, and when Max pressed the 'Standby" button, nothing happened: he couldn't move the helm! After a couple of tries, he gave up on Standby, changed the setting from Navigate to Auto, and turned the boat with the autopilot controller. We passed within a couple of boat lengths of the smiling fisherman, who waved at me as we went past, and probably had no idea of how close we came to ruining his day. Once we were clear, Max tried again to disengage the autopilot. He keyed it back into Standby, and tried to turn the wheel. It was very stiff, but eventually the kids on the aft bunk heard a 'pop' from the lazarette as he suddenly managed to move the helm. After this we could hand steer, but we could not get the autopilot to engage. Troubleshooting after we arrived revealed that the solenoid on our 18-month old autopilot had malfunctioned, and we spent the next few days in touch with the manufacturer, the dealer, and a very helpful hydraulics rep in the US [Dave at Ocean Inlay] for advice on how to proceed. Stay tuned for our experience of Raymarine's warranty support. We had expected to motor up the length of the lagoon to the Majuro anchorage, but a wind shift enabled us to sail right up to the town. We maneuvered through the fishing fleet and beside various Chinese and Japanese boats to lower our mainsail. We were surprised to find that all of the moorings were full, but we were able to anchor near the fleet in 50 ft of water. Max went ashore that afternoon (Friday 4 Jan) in our dinghy to clear in, and by evening, we were enjoying sundowners in our cockpit brought over by our friends on Whitehawk, whom we hadn't seen since Fiji. It was a lovely end to what seemed a very long passage. Crossing the Equator for the fourth time in Fluenta. Greetings from the middle of the trip, where the winds don't seem to have seen the forecast. We thought we had sailed into the bigger winds yesterday morning, when we had up to 10 kts. Victoria baked bread (white only, as it turned out that even in vacuum bags, our whole wheat flour did not appreciate its long sojourn in our cupboard) and it seemed like we were making good progress. We celebrated in the afternoon that we were more than half-way from Fiji in our usual Fluenta style with a sunset bag of chips. Dinner was 'mahimahi alfredo' with the last of the previous day's mahimahi (a nice change from fish and rice) in a building sea, and again it seemed like we were into the wind, battening down for squalls overnight. We slowed down just before sunset to let a big squall move ahead of us. By after dinner, the squall had passed, the sun had set, and the evening was very dark: the glory days of the waxing moon from early in our trip have made way for the dark nights of the waning moon, which is now not making its presence felt until well after midnight. As I was settling into my watch with calm seas and light wind, a dark shadow moved in beside and front of me. It was amorphous and didn't seem to have the defined shape of a typical squall, so I didn't think much of it. Next thing I knew, I had 16 kts of wind, rain, and shifting winds that clocked around from every direction. Each time I looked at the radar, the picture looked the same: a big splotch of colour was sitting on top of us, and not moving off very fast. Somehow, this squall set the conditions for the next 24 hours. Even post-squall when the wind dropped, and I motored in search of the prevailing (forecast) winds, we could not find consistent conditions; at one point I watched the wind clock around 270 deg on the compass before wandering back. We weren't the only creatures confused by the weather: when Johnathan and I were reefing the genoa in the pouring rain, we heard a thunk then a squawk, then I shone my light on the back deck and a little black and white bird had fallen to join us. A group of birds had been circling our sails calling to each other in the dark (it sounded like they were commenting on this funny sea creature they had stumbled across, or it could have just been complaints that we weren't throwing fish bits over the side). Our little friend spent today on the back deck, nursing a drooping wing, and watching the goings on with interest. Johnathan has been our resident vet, moving him to safety when he wanders out into the area of the active lines and offering some of our leftover fish (which he hasn't eaten). I'm not sure what we will do if it is still aboard when we arrive to clear in, and I am hopeful that a few days of R&R will be just what the Dr ordered to restore the wing to full operation. Turdy Birdy who stayed with us for a few days. We had another reminder that we are not alone in the ocean this morning: a pod of dolphins swam by mid-morning. They were clearly on their way somewhere, because they did not stop to play or say hello. They were purposeful in their movements and moved past the boat without any interaction or acknowledgement. No pictures of the dolphins but here is the gecko that adopted us. What he is doing on the upper decks I do not know. Max spent most of his afternoon watch alternating between motoring and sailing. He and the kids put up our spinnaker pole to give the collapsing genoa some structure, and this helped us make some progress. It shows how deeply asleep I was during my off-watch that I was completely oblivious to these on-deck maneuvers! I have commented a lot on the brightness of the sky when we have been sailing under the full moon. The last two nights have offered a little of the opposite perspective. It is almost as if a grey wool blanket has been settled over the sky just above us: the darkness is deep and complete. Without the moon, there is almost no variation in the clouds, and with the thick cloud cover, there are hardly any stars. There are no other lights around, so we are engulfed and enfolded in shades of black and grey. It is always a relief when the moon starts to make its presence known! We remain hopeful that the winds will be as forecast tomorrow, and we will be able to sail all the way to Majuro. Grade 10 at sea. Projects due on arrival in Majuro ! The kids and I played Yahtzee (a Christmas gift) in the cockpit all morning. It was fun because it engaged everyone, including Benjamin, who was my dice-rolling partner. Johnathan finished as champion but everyone was hooked :) Victoria liked the game because she could keep knitting Christmas mittens in between turns. When Benjamin woke up early in the morning, Victoria told him all the devices were still in the oven for protection from lightning, so they got busy with markers and paper. By the time I emerged from my off-watch, Benjamin had created a 'dinghy-donkey' dinosaur that was as tall as a tree, had red and green stripes, and ate apples as its only food. This creature captured his imagination for most of the day. More mittens for the Fluenta crew in preparation for Alaska. The most exciting thing to report today is that we have not seen lightning for 24 hours. We still kept our devices in the oven as a precaution (and to prompt Benjamin to play with something that didn't plug in), but the skies have been much more subdued than they were the first night. On the other hand, we have not seen wind above 7 kts, either, so we are making slow progress. Fluenta sails beautifully on a close reach in light air, so it seems like magic to have 6 kts of true wind and over 5 kts of boat speed. We have motored here and there when the wind dropped even lower, but for the most part, we have just been ghosting along on flat seas. Flat seas make for easy cooking, so dinner tonight was freshly fried Mahimahi and rice. Lunch today was leftover mahimahi and rice from yesterday :) Lunch tomorrow will be the same. After that, we need to catch another fish. Johnathan and I had a nice chat in the cockpit when the rest of the boat was sleeping. These are the moments under the stars that my mama-heart holds on to. We are pretty sure we had dolphins following us for a few minutes: we could hear puffs of air, and we could see streaks of bioluminescence. I wouldn't let him shine a flashlight on them, so we just had to guess, but we certainly had some kind of company on our watch for a little while. Tuvalu to Marshalls - Days 1-2 - Christmas, Sunshine, Lightning, and Whales! After a lovely, but quick, Christmas at anchor in Tuvalu, we stowed all the presents and decorations and set off for the Marshall Islands on the morning of Boxing Day. "Monsoon Westerlies" are expected in the area next week, and it was surreal to think that the area around Funafuti, where we had a sea of glass and less than 5 kts of wind, could see 25-35 kts westerlies and heavy rain for a week or more. and then into the new books ! Benjamin is very impressed with his new jacket and backpack. All ready for BC except he will need socks and boots too. The days have been idyllic: sunshine, light wind (some motoring, some sailing), making water, taking showers. We caught a mahimahi on both days, so dinner tonight was rice and fish, which was perhaps a nice change from the Christmas roast and leftovers that have made up the previous meals. The temperatures are climbing as we head for the equator - we saw 34 deg in the cabin, and over 32 deg sea temp today. Last night, on the other hand, was an endurance event, both physically and mentally. We spent the evening sailing very slowly, with winds around 6 kts, close reaching. We began seeing lightning well before midnight, and numerous squalls broke into Max's off-watch as I needed him to come to the cockpit. At one point, we encountered a mass of squall activity that stretched for miles: no matter how we looked at the radar picture (which was literally a picture - I snapped photos of our radar screen at the chart table to show Max in the cockpit) there was no obvious way out to clear skies. I had just been contemplating starting the engine as the wind had dropped off, when we went under the dark cloud and the wind went from 6 kts (barely enough to sail) to the mid-20s in short order. Soon, Max was reefing the main and I was furling the genoa, in an effort to reduce our sail area as quickly as we could. The wind and rain made things interesting, but they didn't test our nerves the way the lightning did. I found myself developing a new, and visceral, appreciation for folks who have lived in a bomb zone: lightning was flashing all around us, and there was no way to know whether it would get close enough to strike us. Each flash that I saw caused an instinctive startle reflex. Rationally, I knew that no matter how close they seemed (bright enough at times to dazzle my night sight) with a count of 15 second as the nearest roll of thunder, they were still some distance from us; however, emotionally, my nerves were jolted with each strike. Just when I was thinking that I hadn't seen any lightning in a while, a massive, jagged horizontal flash lit up the two clouds beside me, looking for all the world like a drooping electrical wire between two poles in a kids' cartoon. Yikes. Not over yet, I guess! Needless to say, once the lightning was close enough that we were hearing thunder, we put the laptop in the oven with the rest of the hand-held devices that were already there and unplugged our Iridium GO, all in the hope of minimizing damage in the case of a lightning strike. In general, squalls will move with the wind (ie they go from upwind to downwind) but at one point, we had such a windshift that upwind became downwind so it was hard to tell which way the clouds would go! After a 100-degree windshift, we found ourselves sailing due East with wind out of the North. Even though it might have been a temporary situation due to the cloud above us, we decided to tack to maintain a better course (and to maneuver away from the darkest mass of clouds), even if we had to tack back in a few minutes. As it turned out, that wind stayed strong steady for at least an hour, so it was a good decision. The after-supper person (ideally me) is usually on watch until about 2am, at which point they wake the other, who has by then (ideally) had 5-6 hours of sleep, and is ready to stay awake through the rest of the night. Being the first night on passage, last night was not exactly ideal. Dinner and Benjamin's bedtime both took longer than usual, so by the time I was ready to relieve Max and take the watch it was already about 10:30. The squalls started by midnight, and they kept needing both of us to either react or make decisions, which meant that Max spent most of his off-watch in the cockpit (sometimes for just a few minutes, and once for over an hour). With such a broken off watch, it was 4:30 this morning before I shook Max to come and stay in the cockpit. This morning, Max and Victoria were preparing for a (generally rare) morning squall when they noticed a massive bait ball of fish near the boat. This in itself is unusual and the situation was made more unusual when they saw the tell-tale 'puff' from a whale: some kind of large whale was fishing next to us! This is one of the random ocean encounters that we hope for, but rarely see. The kids have spent their time reading, playing video games, and knitting. This afternoon, I woke to see them 'tripling' on the couch, which I find to be one of the loveliest sights to behold: all three kids are engaged and playing cooperatively together, despite a 10-year age gap, with three blond heads lined up on the port bench. The morning clouds cleared away, and the afternoon was sunny. By supper time, the sea was so smooth (<2kts wind) that it looked like molten glass rolling by us. After one squall at 10pm, where Johnathan helped by closing all the windows and hatches downstairs, I have spent my (much more typical) evening watch bracing for bad weather, but actually enjoying a clear and cloudless sky. We are expecting the wind to fill in my mid-day tomorrow, but for now we are motoring with about 3 kts of wind, without a squall in sight (the 12nm radar picture is clear). What a difference a day makes! A Christmas dinner feast ! Christmas Dinner in the cockpit. We anchored for Christmas Friday afternoon under sunny skies, with the "Q" and Canada Flags secured snuggly to their halyards, and freshly caught mahi mahi at rest in our fridge, expertly filleted underway by Victoria. With Christmas music from our bluetooth speaker providing the soundtrack, we entered the long and narrow western pass to Tuvalu with a minimal current and set our anchor by 4:30pm. Getting ready for Christmas. Note the coconut manger. Getting ready for Christmas. Victoria crocheted nativity set and the goofy dog and penguin date from our distant land life. Leaving Fiji last Sunday, we kept the idea of stopping as a quiet option in our back pocket, mentally preparing ourselves for the 'romance' of Christmas-at-Sea (likely hove-to for 24-36 hours), but privately hoping that we would have favourable weather to be at anchor at Tuvalu (as the 'romance' would have worn through pretty fast with the winds in the squally convergence zone gusting almost instantaneously from light to 25 kts all night). Both of the last two days (days 4 and 5) at sea were pretty much repeats of earlier days: sunny skies, calm seas, and light winds (max 8 kts), which made for glorious sailing (if sometimes a little slow). We didn't see anything besides a couple of plastic bottles from the time we left Fiji until we were approaching Tuvalu, where we saw two very small open boats heading for the nearby fishing grounds; we had no traffic of any kind on our AIS. 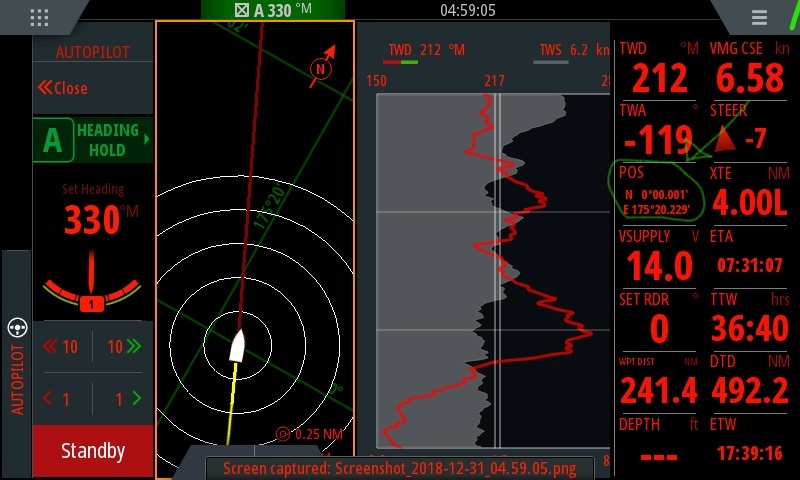 Even if we don't see them visually, we usually have some freighters and fishing vessels as much as 40 nm away on our AIS display. We seemed to be the only occupants of the ocean for hundreds of miles, with the exception of the odd seabird who swooped in to have a good look at our fishing lures. This is a rather humbling sensation. The kids had fun keeping themselves occupied (which included baking sugar cookies with home-made coloured sugar (V&B), listening to four audio books (J), 'tripling' on Minecraft (all three), standing watch (V), making Christmas presents (V), and maybe even doing some school work (V - she even used our satphone to call into her weekly conference with her teacher at 0730 Wednesday morning)). The days also presented the usual boat challenges (for instance, the bronze handle to our head not only wiggled itself loose, but chafed away some of its bronze around the shaft key, which had become misaligned; thankfully Max managed to press the key into the proper position and then get the set screw on the handle to snug down more tightly. I think I was the one who had erred a little too much on the side of caution a week or so earlier when we had it all apart). Max also took advantage of the flat conditions to transfer diesel from our jerry cans to our internal tanks; he does this with a siphoning hand pump into the cockpit tank. The glamour of cruising ... transferring diesel at sunset. The evenings (when I usually write emails) were a different story - thus the delay in sending this update. As a matter of practice, we learned to store our hand-held electronics in the oven as some protection against lightning. There didn't seem to be much rhyme or reason for electrical activity (benign, gentle-looking clouds would fill the sky with lightning, and big angry ones would be silent and dark) but most nights we would see lightning several times each hour. Instead of spending long stretches at the chart table, with occasional glances around the horizon at the cue from my timer, I found myself glued to my seat in the cockpit watching for lightening and the big clouds that indicate approaching squalls. It is hard to describe the horizon, but we were surrounded by fantastically shaped clouds, sculptured lumpily and exuberantly in three dimensions out of the most vivid imagination: it is easy to imagine all kinds of people and cartoon creatures going on about their business above us. The nearly-full moon was our companion for all but the last couple of hours on watch, so the sea and the clouds were lit brightly enough that we hardly needed a flashlight to see the sails. For most of the evening, it was extraordinary to have an almost perfectly clear sky, the nearly full moon reflecting off of a gentle sea, and not much more than this crazy line of clouds in the distance as company. Amazing. In general, after this quiet early evening, the squalls would start by 11pm. During my watch, I would observe an ominous shape upwind of us until I was certain that we were in its track, then I would call Max to come to the cockpit, where we would reduce the sail area, close the rain panels, and hang on! If you look at our plots through the Predictwind tracker, you will notice sudden turns away from our track that carried on for as much as two miles: these are the points were we turned downwind to reduce the apparent wind and the forces on the boat. At 0130 on Wednesday evening, with about an hour left in my watch, and in preparation for a sizeable approaching squall, I was at the chart table watching the radar, and monitoring the wind on the instruments (steady at about 11-12 kts). I felt like things were about to shift, so I woke Max (somehow he manages to single-hand through these squalls, but I find it easier when there are two of us in the cockpit for furling, etc, especially when the easing winch and the furling winch are on opposite sides of the cockpit and the rain enclosure is preventing the winch handle from making a full turn). By the time I got to the companionway stairs, the wind had shot to 17 kts and kept climbing to about 22 kts. We were close-hauled on wind-hold (which means that we set the wind angle for the sails, and the boat adjusts its course to follow the wind shifts), which meant that the apparent wind was significantly higher. By the time I managed to turn the boat downwind, our speed through water had reached almost 10kts! Thankfully the sea-state was slight, and the boat responded quickly to the autopilot (and there is an autopilot control at the companionway in addition to the ones at the helm and the chart table). We ran downwind with the sails still sheeted in (to reduce their effective area), but it still took about 20 minutes before we were able to turn towards our course again. We decided on an early watch change, so before long, I went off-watch and Max was in his own company in the moonlight watching a clear sky and cloudy horizon as if nothing had just happened (other than the wind never shifted back to the point that he could actually aim the boat at Tuvalu). On Thursday night, we had a similar situation, only it didn't end with the usual 'run downwind and then return to our course' technique. As 11pm approached, I had the sense that we were sailing into darkness, and that we were going to have to earn our anchorage in Tuvalu for the following day. The winds had been steady around 10 kts all evening, and we were sailing comfortably, albeit close-hauled, but the sky ahead was black in every direction. The only saving grace was that I didn't see any lightning. By 11:30, I felt the first drops of rain and the tell-tale change in the wind (at the edge of a squall, the wind usually shifts about 30 deg and jumps significantly in strength); entering a squall area is like going through a door: one minute all is calm and quiet and the next the wind has been turned on. Max and I turned downwind and reefed the genoa together; even with a small sail area, we were travelling at over 8 kts. The next step was for Max to reef the mainsail; even with the reef, we were still hurtling along. I had a look at the radar, and the screen was a mass of green (which means rain) - the cloud stretched out about six nm. As with the night before, we quickly had 25 kts and pelting rain. Even when we thought the system was abating, it only caught its breath and came again with more gusto. Finally, after about an hour of sailing together, we decided that we would once again do our watch change a little early, and then I would come back on after a few hours of sleep in the saloon. Max sailed through one squall after another for the rest of the night; at one point we heeled so much that Victoria came running from the forward cabin because the sound of the water about her ears in the top bunk had woken her up. In the course of the next six hours, the wind and rain never really abated and continued to blow straight from our desired course. Tacking with the wind shifts of up to 90 degrees meant that progress towards Tuvalu was slow. There was no doubt but that we had to earn our place at anchor! Our final morning at sea was particularly exhilarating. With a full main and most of the genoa, we churned along in 12-14 kts of wind. Victoria and I adjusted the size of the genoa to keep the boat under control, but our boat speeds were still in the 7.5-8.5 kt range, which is high for us. We were squeezing every bit of speed out of Fluenta that we could as the end was in sight, and there was a chance that we could enter the lagoon at Tuvalu with enough light to transit across to the town and anchor before dark, but since we could not actually make our course - as hard on the wind as I could push the boat, we were still as much as 30 deg away from our mark, anchoring before another night at sea was not a given. Eventually, Max and I elected to enter at the Western pass rather than the Southern pass (which we had used before), as much because we could sail to it as because it was more protected from the swell. If the lagoon were a clockface, the pass would be just below 9:00, so after all this excitement, we had a beautiful and leisurely sail around the outer edge of the reef (ie once we passed the '6:00' position at the southern edge: it was one of the most picturesque periods of the passage, with the motus and reefs providing a backdrop to blue and turquoise waters and sunshine. The pass was narrow and very long, but with satellite imagery, and constant communications between the bow and the helm over our bluetooth headsets, we navigated it without incident. Now that we are in Funafuti, it looks like we will have a weather window to carry on with our journey to the Marshall Islands on Boxing Day .. stay tuned for our next at-sea update. Lots of space for yoga. A quick note to cover two days - in my usual time of writing last evening, we had the laptop unplugged and the small devices (VHF radio, satphone, GPS) in the oven. We were not doing some kind of strange Home Economics experiment: we use the oven as the closest thing to a Faraday Cage that we have on the boat, and we put the electronics in there when we have lightning, of which we had plenty on our second night! Thankfully, it was at a distance, and mostly downwind of us (meaning the clouds weren't coming our way) but it is disconcerting to see the entire night sky lit up every few seconds! Watching the world go buy at 6 kts. Both days were pretty similar: stretches of motoring interspersed with stretches of light air sailing. You can see the difference in our track when we motor and when we sail: the sailing track veers off in a wobbly line that follows the wind, while the sailing track heads straight down the rhumb line [although at the time of sending this we are actually sailing down the rhumb line at a reasonable speed]. The kids are settling into a routine of being on deck, playing video games, and watching movies together. It is quite cute to see Benjamin snuggled in beside Johnathan's shoulder with one ear bud each. When watching alone, Johnathan has taken to wearing the bright yellow ear defenders over the ear buds in order to hear better over the sound of the engine. It is actually quite pleasant to be ghosting along on a calm sea at 2-5 kts :) It is a dead-end thought process to notice that we could just about walk faster than we are sailing at times, but every 25 min that we don't motor is another 1/2 gallon of diesel that we don't have to carry in a jerry can (of course, I used the 'royal we' there, as it is always Max's turn to carry the diesel, and what I meant was that it was another jerry can that he didn't have to carry!) It is a slow trip at times, and I am certainly grateful for our Perkins engine that we can flash up when the doldrums get to be a bit too much. The flurry of preparations have been completed, the last phone calls have been made, the last treats at the grocery store obtained (extra butter for Christmas cookies, via the paddle board! ), and at last we are at sea. After a busy season that culminated in a surprise trip to the boat yard, there is something to be said for the simplicity of just sailing the boat. I am not generally fit to sit at the chart table on the first night, but the combination of Bonamine and flattened seas have made for a pleasant first evening watch. This is usually the busy time, with squalls expected throughout the night, but today (thus far) it has been Max and Victoria with the busy afternoon watch instead. We had a forecast for single-digit winds, and instead, they had up to 22 kts behind us, which was an exhilarating start for the father-daughter team while I took my first off-watch sleep. We had some steeper seas earlier (wind against current, perhaps) but now they are just rolling powerfully behind us as we sail on a broad reach. I am having one of those evenings that people visualize before they sell their house and sail away: the sky is a high and bright dome covered in stars, the moon is reflecting off the water lighting up the whole area, the wind is steady at around 12-15 kts, we are moving along at anywhere between 6-7+ kts, and the motion of the boat is pleasant. Benjamin lay down on the aft bench of the cockpit and just fell asleep with no drama. Johnathan poked his head up through the aft hatch and we had a conversation about how beautiful the evening was (and about whether he might enjoy army or air cadets more when we got home). Lovely. I am sure we will have all kinds of conditions as we make our way towards Canada, but so far, this evening is one for the memory books. This afternoon, Max and Victoria had a much busier watch, with shifty winds and eventually a gybe. I have to say that it was pretty nice to be laying on the aft bunk, off-watch, while the two of them completed the maneuvers; a few years ago, I would have had to come up on deck to help, but with strong and capable teenagers in our crew, the grownups can get much more sleep! At times, Victoria and Max were surfing down waves at 8-10 kts! There is a unique sound when we have the waves at just the right angle behind us and a wave comes surging powerfully under the hull; we heard it regularly this evening! It's beginning to look a lot like Christmas ... Victoria and Benjamin decorated our little tree yesterday. Most people at home have to lash their tree to make sure the cat doesn't knock it down; in our case, it is lashed to the bulkhead so that the boat's motion doesn't send it flying! This afternoon, she made my mom's Sunbeam Cookies while I was asleep. For me, these are a taste of childhood, and so good!! We already caught our first fish, but it was a barracuda, so we sent him back from whence he came. Barracuda have a stronger likelihood of passing along siguaterra, so we don't generally keep them. We don't know where we will be for Christmas - but we will keep you posted on our wherabouts, or you can track us via our blog or YIT. PS - The night-watch layers report: Seatemp is 29.6 deg C. Air temp is about the same. I was comfortable in the cockpit with a light hoodie, shorts, and no blanket (of course, the rain enclosure was closed).